In-Between Hops: End of an Era? In the month of April in all of Major League baseball, the overall composite slugging percentage - the ultimate power statistic - was .401. That's the lowest April slugging percentage in 15 years. 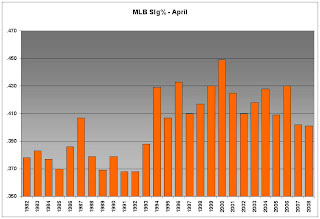 Overall slugging percentages tend to go up in the summer months when the weather gets warm, so to put 2008 into proper context, I only considered the April numbers. There is still a ways to go to get back to the 1980's levels and with all of the new smaller parks, we may never get back there, but early signs are that last year's reduction in offense may not have been a fluke. You've probably figured out by now that this is an article about steroids. If steroids in baseball are truly on the wane and as a result the offensive numbers that players put up begin to moderate, we will eventually have a clear before, during, and after map of the steroids era. We will be able to estimate, with some accuracy, the effect of steroids on players' stats and once and for all put those statistics from this dark time in baseball into proper perspective.